Gentlemen; I am sure you will excoriate me for sending this. I just finished listening to the episode with Ghazi Farooq. I was hoping to get some interesting information from the cast as I have been looking at the Teiz website recently and am in the market for technical gear. Unfortunately any value was lost in the cackling and other shenanigans that went on. Luckily I was listening in my car, as I would hate to have the Beevis routine in my headset on the bike. 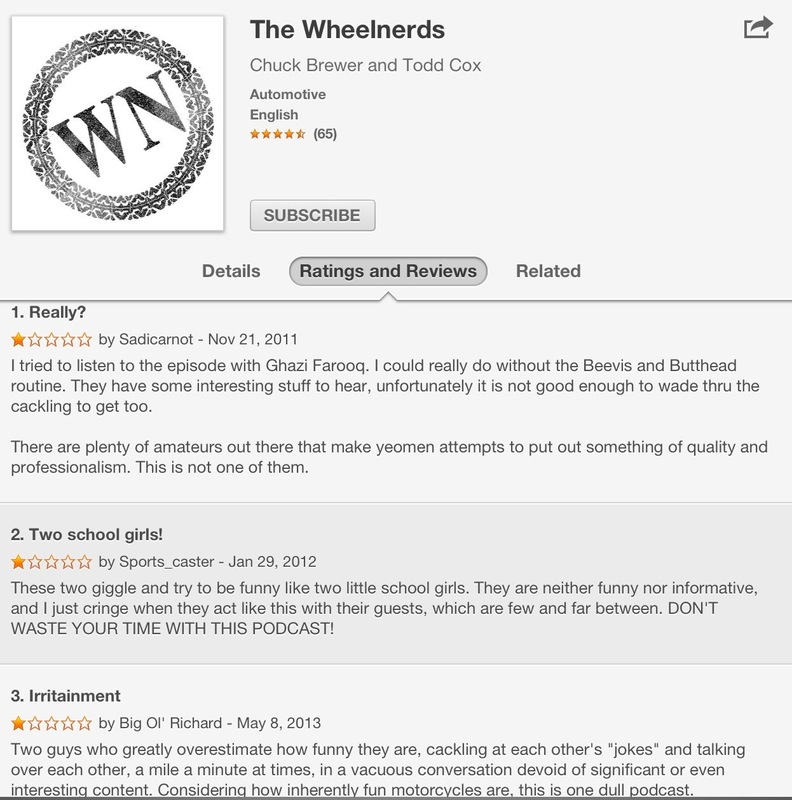 Podcasts really fall into 2 categories; professional and sophomoric amateurs. Too bad you guys chose the latter. There is a lot of potential particularly when you were talking about the fairing for the Ural. Of course anything intelligent quickly deteriorates into the cackling. I found myself wondering what the hell you we’re talking about most of the time. Do us all a favor and listen to some other podcasts that are at the top of the charts on iTunes. Good examples are the Mac Roundtable, Pace Podcast, WTF with Marc Marin, Mac Geek Gab, Guy on Girl with Aisha Tyler, Radio Lab, and This American Life. You guys should aspire to those and not Beevis and Butthead. All of the podcasts provide great value as well as funny bits and no cackling.